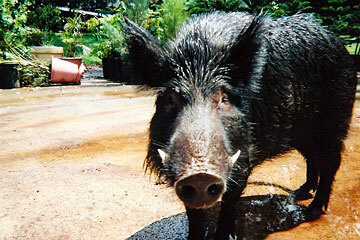 Porky, a friendly 300-pound pig, was killed Oct. 22 in the carport of a couple who rent a house on a 130-acre lychee farm just above a Mililani Mauka subdivision. Police charged a 28-year-old man yesterday with felony theft of livestock after he allegedly killed a pet pig named Porky who was featured in an Island Air commercial. Joseph B. Calarruda V, who was on probation, allegedly knifed the pig at about 11 p.m. Oct. 22 in the carport of a couple who rent a house on a 130-acre lychee farm just above a Mililani Mauka subdivision. "He's one of our pets, just like anybody's dog," said Aaron O'Brien, Porky's owner and resident manager of the farm. Porky was born on the farm to a feral sow that O'Brien had trapped, and enjoyed having his belly rubbed and performing tricks. "People can't get away with killing people's pets," said O'Brien, who was on the mainland when it happened. Because of Hawaii's new law on theft of livestock, and because Porky's only TV spot gave him a value of $2,000 to $5,000, Calarruda was charged with felony theft. Otherwise he would have gotten off easy on a misdemeanor charge, O'Brien said. "(Porky) had a future; that's how his value is figured out," he said. "To me he's worth more than that." O'Brien and his girlfriend, Camilla Skold, said they would like to see tougher laws in Hawaii to make animal cruelty a felony. They have received an outpouring of support, from the Humane Society of the United States to Greenpeace and animal-lovers. Calarruda remained in custody last night in lieu of $50,000 bail. Police arrested Calarruda on Wednesday. He has been on probation since 2002 for a kidnapping conviction, and is scheduled for trial Nov. 27 for possession of a prohibited firearm. On Oct. 22, Calarruda's hunting dogs allegedly cornered the 300-pound pig in the carport, according to a couple who are tenants on the farm. They asked not to be identified out of fear for their safety. The husband said he kept yelling, "This is private property. This is a pet pig. Get your dogs and get out of here." But Calarruda allegedly went into the carport and stabbed the pig to death, leaving blood everywhere, said the couple. He then hauled the pig to the edge of the carport and cut one of its legs off, they said. That was when they noticed another man standing to the side of their house with more dogs on leashes. "My husband screamed, 'Porky's dead!'" said the woman, who was fond of Porky. "I started screaming. I was just so sad. I was in shock." She called 911, and the two men fled with their dogs into the forest. The woman said responding police asked, "That's a pet? Was anyone hurt?" and told her there was nothing they could do. "We thought it was absolutely hopeless," she said. However, her husband led officers to where the men's truck was parked, which eventually led to Calarruda's arrest. The wife, who had befriended Porky with apples, said she was devastated, and mourned the 5-year-old hog's death for four days, unable to go to work. "Porky's everywhere," she said, pointing out hoof prints in the carport and the ginger patch where he slept near their house.